The forests of Madagascar showed me more than I could have asked for and taught me every day in unexpected ways. This fairytale island was the most giving and gracious of lands, offering breathtaking views in every direction and a larger-than-life array of unique plants and animals, never once making me feel unwelcome or uncomfortable. I left Madagascar understanding the astounding beauty and diversity of the island that sits on the brink of extinction if ignored. The gem that is Madagascar is invaluable. There are compassionate people and dedicated scientists working toward saving the wildlife of this island by creating no-take-zones, forming protected forest boundaries, and earning grants for educational and environmental movements. When, though, will we plant enough trees to replace what has been taken? One afternoon, while on a survey, our team was sharing our favorite idioms, and one of the Malagasy forest experts aptly said: One tree is not a forest. I am forever indebted to Madagascar for showing me the hauntingly beautiful meaning of this phrase. There it lay, coiled up in the middle of our path, the most beautiful green creature I ever laid eyes on. Our reactions varied from utter fear to pure excitement, and in the blink of an eye the Malagasy forest guide was placing a cold slithering green tree boa in my arms. I could feel every muscle movement, and I knew the boa could feel every one of my cautious breaths. During my time trudging through the forests of Sainte Luce, Madagascar, I learned that these creatures are not venomous. They are mostly found on the ground and only in trees when hunting. They range in color, and I witnessed the behavioral differences of the darker brown ones, which are faster and more aggressive. 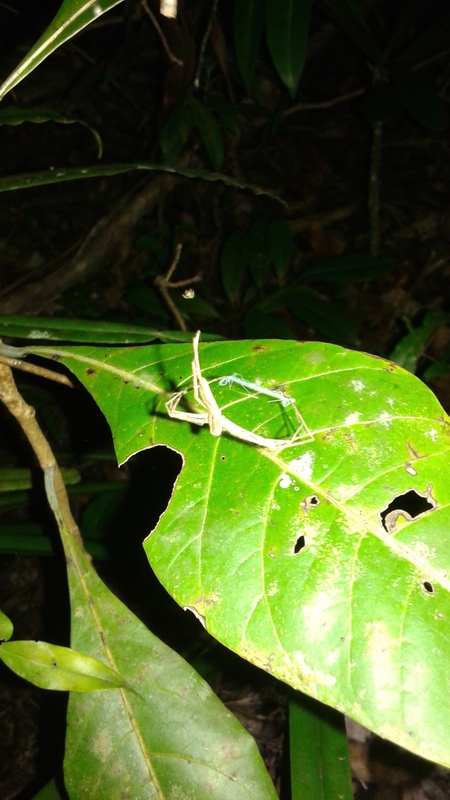 While on a nighttime survey I stumbled upon a net casting spider (Deinopis Madagascariensis) holding a sticky silk net in its legs, awaiting any prey to launch it at. Yes, a spider that catches prey with a net! I also met one of the world's smallest frogs (Stumpffia pygmaea), which played dead while we analyzed her pregnant belly in my hand. These frogs have one elongated finger on each hand, while all other fingers are significantly short. Chameleons do change color in front of your eyes according to their mood. Both fat-tailed dwarf lemurs and mouse lemurs experience a period of torpor in which their metabolic rates slow down and they experience slower activity and partially depend on stored fat while avoiding traditional hibernation. I was lucky enough to find these species by spotting their bright, distinct tapetum lucidum (light reflected through their eyes) during night surveys in the middle of the forests. I also saw a mouse lemur nest during the day with my own eyes. Snail shells the size of a pinhead may outgrow the size of an adult hand. I stood under a family of brown lemurs while they ate fruit from a tree and spat the seeds down to me. I watched them while they watched me, heads tilted and eyes wide. They all have the most gigantic orange eyes and the sexes of this species actually have no distinguishing marks between male and female. In another memorable moment, I met a ring-tailed lemur who uncharacteristically approached our team by himself on our campsite. He was friendly and outgoing, and as I reached out to him, he grabbed my fingertips with his! Mushrooms varied more than I could have guessed, from shelf to toadstool and gold to purple and blue. The forest trees are decorated with tiny camouflaged burrows inhabited by small caterpillars. These caterpillars use tiny twigs and forest moss to sleep hidden from predators. Radiated tortoises, elegant and endangered, exist in a class of their own. Their intricate designs and gentle presence are unparalleled. With the help of an expert I was able to lift both a female and male to see their undersides. The bottom shell of the female is flat, while the males possess a concave underside in order to better mount the female while mating. Evolution wins again! The lobsters of Sainte Luce are as bright and gaudy as the sunsets that they live in—from purple and blue to spiny and prehistoric. I was able to see females with large pink egg sacs tucked under their appendages and lobsters ranging in length from 12 to 19 centimeters. The lobsters caught off the shores of Madagascar deserve more reverence than a Japanese serving plate. The geckos of Madagascar are so much more diverse than I expected and they are everywhere! We encountered a few leaf-tailed geckos at night, one of which leaped onto our forest guide and had to be pried off. We also had many day geckos as our campmates, lapping up left-behind honey and hiding behind bulletin boards. The beauty of the spider lily remains incomparable; this toxic flower looks like something grown in a circus-themed garden, but it smells as sweet as candy. More mushroom varieties than I imagined! The countless fields of wild pitcher plants are unbelievable, spanning across miles of marshes and containing tons of tiny insects caught in their venom traps. We stumbled upon a few termite mounds, some intact like large tumors in the canopy of the trees, engulfing limbs and threatening the life of the host tree. Other mounds we found were fallen, with scattered pieces on the ground, reminiscent of spongy bone trabeculae. Of course, no Madagascar flora and fauna recap could be respected without saluting the land's mascot: the lemur. I was lucky enough to be face to face with multiple species of lemurs while witnessing their different behaviors and personalities in their natural habitat. I listened to a family of sifaka bellowing their warning call as a predatory bird flew over head, then later watched them skip across a field of grass on their hind legs while thinking "Ah, that’s why they are called the dancing lemur." I learned that the dark spots under their arms and legs are actually hardened pads that excrete pheromones and are rubbed on trees for marking territories and calling mates. I walk away from this experience relieved that every magical aspect I was taught of Madagascar's wildlife is absolutely true, from the dancing lemurs to the emerald snakes. I also walk away a bit heartbroken that all of the environmental warnings are true as well; as I admired the flying foxes in their home I heard the echo of logging in the background, and while stalking dragon flies through the forest I walked along carpets of wood chips and stumps. The tavy smoke stacks are present from thousands of feet in the air and endless crop fields kiss forest edges while mining companies are working out contracts to excavate forests for ilmenite to meet international plastic whitening demands.